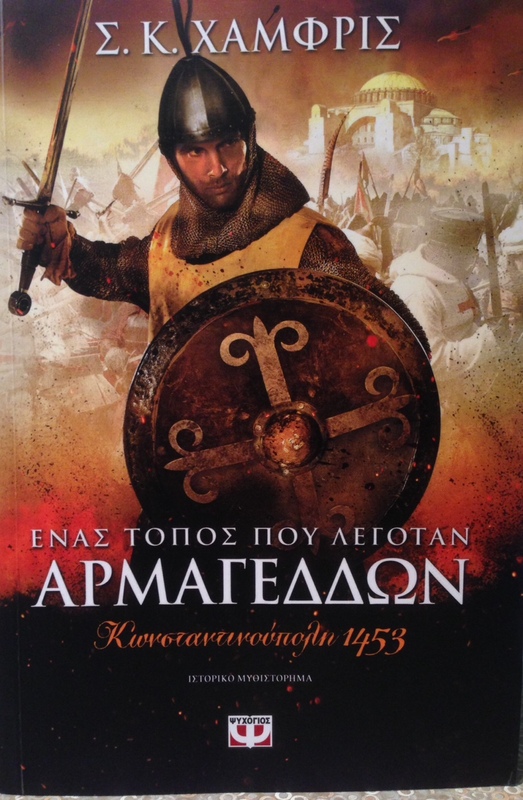 Armageddon In Greece: My novel in the birthplace of literature | AUTHOR. ACTOR. SWORDSMAN. ← A Radio interview: Talking of movies, books, plays – and a sword! Definitely like the Hagia Sophia in the background. One of the most beautiful buildings in the medieval world, still majestic, and a key to the story. Alas, I speak no Greek. So a little confused as to the spelling of my name at the top. I am ‘C. C.’ and that’s… not! Also it’s a little short, isn’t it? Any Greek readers out there who can help me? I think its my 4th or 5th book published there. Never ceases to thrill. I mean, the home of Homer. Herodotus. Heraclitus. Humphreys? Nice company! This entry was posted in Uncategorized and tagged author, books, Greece, novels, publishing news, swords, writers. Bookmark the permalink. a bit of enlightenment on your ‘Greek name’. Since your initials stand for Cecil Christopher, the Greek transliteration requires a Σ for Cesil and a Κ for Christopher. Moreover, the Greek language does not use diphthongs, hence your ‘shortened’ surname. The books is great, by the way. Thanks so much, Sappho. Much enlightened. Just finished reading this. Great story! I’ve also read Vlad: The Last Confession, bought it at PNWA a couple of years ago. I enjoyed it as well.